I’d thought to start this post with some grumblings about the weather, but compared to what many parts of the U.S. have been facing, we’ve been getting off fairly easily here in southeastern Pennsylvania. So without further chatter, here are some Bloom Day highlights. 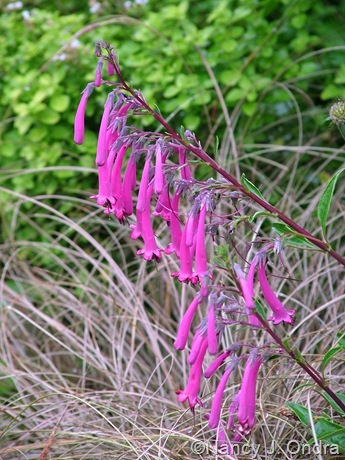 Above, Croftway Purple Prince cape fuchsia (Phygelius ‘Cropurpri’) with ‘Toffee Twist’ bronze sedge (Carex ‘Toffee Twist’). 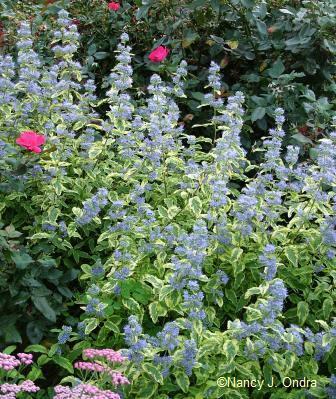 Below, Summer Sorbet blue mist shrub (Caryopteris x clandonensis ‘Dyraisey’). 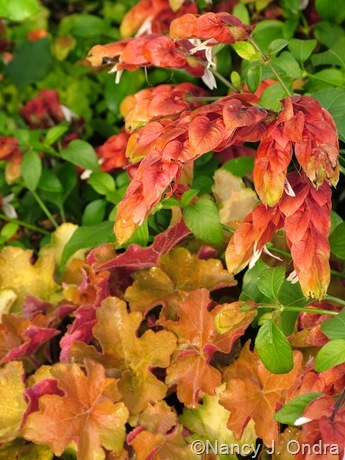 Below, shrimp plant (Justicia brandegeana) with ‘Caramel’ heuchera (Heuchera villosa). 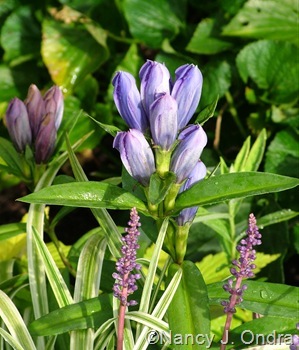 Above, Gentiana triflora var. 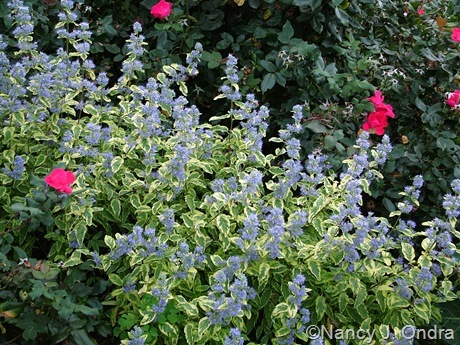 japonica with ‘Silvery Sunproof’ lilyturf (Liriope muscari). 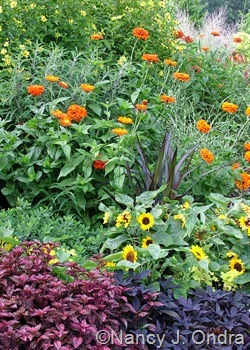 Below, ‘Sunny Smile’ dwarf sunflower (Helianthus annuus) in front of ‘Aztec Orange’ zinnia (Zinnia elegans), ‘Princess’ fountain grass (Pennisetum purpureum), and ‘Lemon Queen’ perennial sunflower (Helianthus), with ‘Sweet Caroline Purple’ sweet potato vine (Ipomoea batatas) and ‘Red Splash Select’ polka-dot plant (Hypoestes phyllostachys). 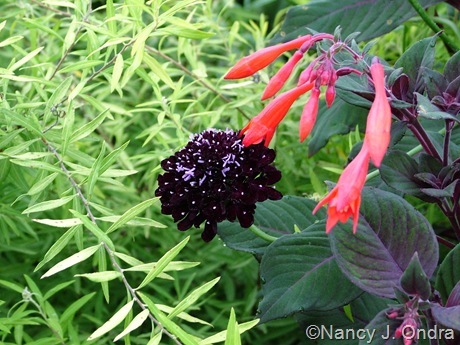 Above, Joe-Pye weed (Eupatorium maculatum) with orange coneflower (Rudbeckia fulgida var. 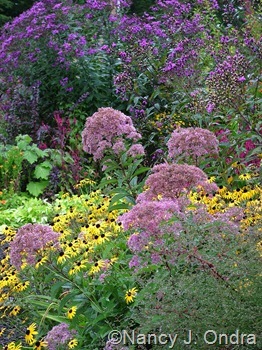 fulgida) and ironweeds (Vernonia). Below, red orach (Atriplex hortensis var. 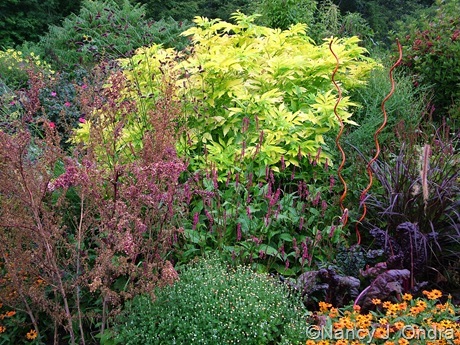 rubra) seedheads, golden elderberry (Sambucus nigra ‘Aurea’), purple fountain grass (Pennisetum setaceum ‘Rubrum’), ‘Profusion Orange’ zinnia, an orange chrysanthemum, and ‘Taurus’ mountain fleeceflower (Persicaria amplexicaulis). 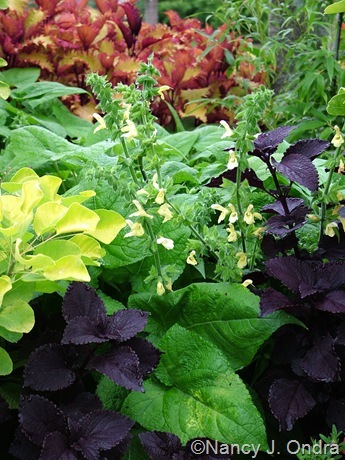 And last, above, Japanese yellow sage (Salvia koyamae) with ‘Dark Star’ coleus and Golden Spirit smoke bush (Cotinus coggygria ‘Ancot’). 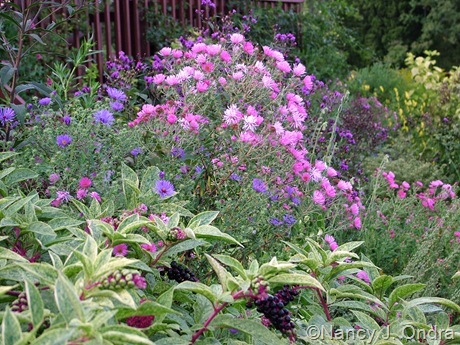 For links to more Bloom Day posts from all over the globe, be sure to check out the main Garden Bloggers’ Bloom Day post at May Dreams Gardens.